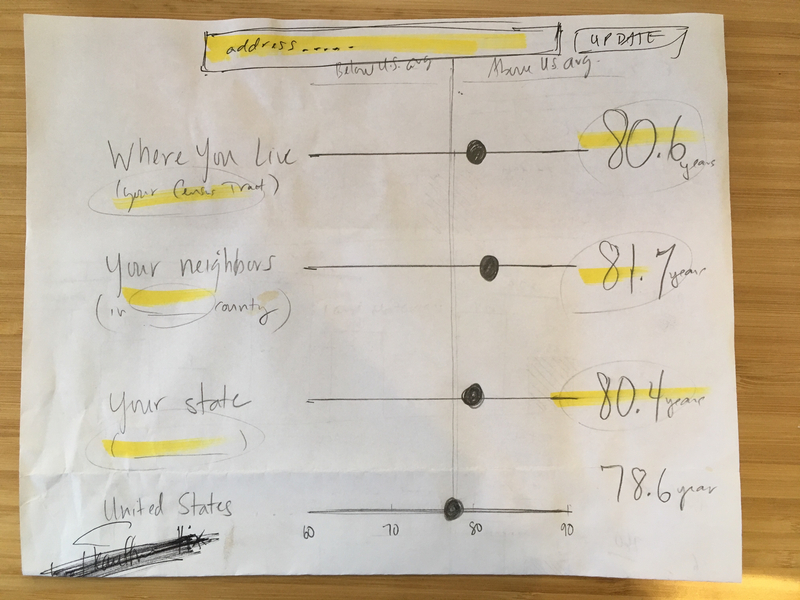 ﻿Does where you live affect how long you’ll live? That’s the question posed by the Robert Wood Johnson Foundation in a newly launched data feature Alley designed and built for the foundation in September 2018. The interactive allows users, for the first time, to find life expectancy for all 73,000 Census tracts in the United States. The neighborhood-level data inside the life expectancy feature are the result of a unique joint effort — The United States Small-Area Life Expectancy Estimates Project (USALEEP) — along with the National Association for Public Health Statistics and Information Systems (NAPHSIS), the Centers for Disease Control and Prevention's National Center for Health Statistics (NCHS), and the Robert Wood Johnson Foundation (RWJF). From the beginning (as you can see in the sketch above), the goal was always to easily be able to see the information on all scale levels. The data are shown on the census tract level, so users can see how their neighborhood compares to others even just a few blocks away. Users can also see data at the county, state, and national levels as points of comparison. The new tool was also re-published by the Washington Post — twice! You can experiment with it directly in this site, or view it within the Post's articles. Previously available data could only provide information at the county-, city-, and ZIP code-level, which often didn’t tell the full story. Neighborhoods right next to each other can experience drastically different opportunities for health and well-being. Census tract-level data, on the other hand, offer information on a much smaller group of people (about 4,000 per tract on average) making it easier to create a more complete picture of health at a local level. As noted above, the Washington Post and other news outlets are directly embedding the feature. They’re sharing it as part of articles reporting on the life expectancy gap between wealthier and poorer locations in the United States. We’re happy to be a part of informing our country about the state of its health. Alley would like to thank our partners at Burness and the whole team at Robert Wood Johnson Foundation for their collaboration on the project.